According to Audrey Mae’s artistic map diagram and her gravestone numbering system, Deborah and Jane ‘s names are on the same gravestone, Gravestone Forty-One. Using a Smith-Corona typewriter in the 1980s, Audrey Mae typed the following mini-biography of Deborah Ann and her sister Jane E., eleventh-generation Spencers in East Greenwich, Rhode Island. 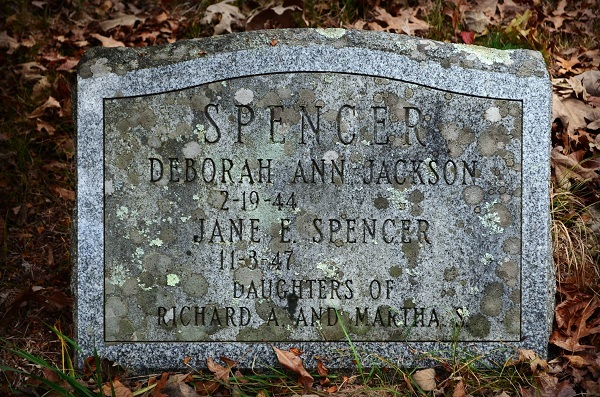 Deborah and Jane are the daughters of Richard Anthony (gravestone number 39) and Martha (née Smith) Spencer and the granddaughters of Alfred Ernest (“Uncle Ern”) and Elsie Jane (née Gibson) Spencer. The gravestone marking gives Deborah’s married name as Jackson. The web site author has no information on Deborah’s husband, a Mr. Jackson, and family. Since there are no dates of death on this gravestone and these sisters are eleventh-generation Spencers in the East Greenwich area, these sisters could still be alive or, if deceased, buried in another place. Audrey Mae often spoke of names on gravestones of people who had not yet died. Audrey Mae would wonder if they would ever be buried in the Spencer Family Cemetery. To purchase a gravestone ahead of time or to put the spouse’s name on the gravestone of the deceased ahead of time was not uncommon. Deborah Ann (née Spencer) Jackson and Jean Spencer are the daughters of Richard Anthony (born 1916) and Martha (née Smith) Spencer. Richard Anthony is the son of Alfred Ernest (“Uncle Ern”) and Elsie (née Gibson) Spencer. Alfred Ernest is the second son of Anna Maria (Mar-eye-ah) and John Johnson Spencer. Anna Maria is the child of Richard Anthony Spencer (born 1817). Richard Anthony is the first son of Richard Anthony (“Deacon”) Spencer (born 1798) and Roby (née Tarbox) Spencer. 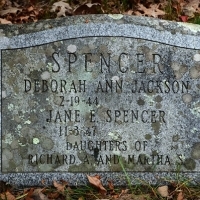 Deborah (née Spencer) Jackson’s and her sister Jane’s headstone is right next to their great uncle Richard Augustus’s gravestone in the Spencer Family Cemetery. Richard (“Rich”) Augustus is the older brother of their grandfather, Alfred Ernest (“Ern”). Audrey Mae’s mini-biographies of Deborah and Jane and their great Uncle Richard (“Rich”) Augustus (gravestone No. 42) and two of his three children are as follows. Deborah and Jane are eleventh-generation whereas their grandfather, Alfred Ernest, and great uncle, Richard Augustus, are ninth-generation. Their great uncle Richard Augustus’ two daughters, Annie and Amy are aunts to Deborah and Jane. Annie and Amy are tenth-generation Spencers in East Greenwich, Rhode Island. Markings on their gravestone show that Jane and Deborah are the children of Richard Anthony and Martha (née Smith) Spencer. Clarification: Do not confuse Richard Anthony and Richard Augustus. Richard Augustus, the brother of Alfred Ernest (“Uncle Ern”), is the uncle to Richard Anthony. As Jane and Deborah are the children of Richard Anthony and Martha Smith, Richard Augustus would be Jane and Deborah’s great uncle. This entry was posted in All Gravestones, Audrey Mae's two uncles and their families, Born into the Spencer line, on December 17, 2012 by Heather.